Many of the flexible endoscopes we receive here at our ESS Service Department can be attributed to fluid invasion. "Fluid invasion" happens when some part of the endoscope allows external fluids (i.e. - body cavity fluids, water, cleaning solution, etc.) to get inside the parts of the endoscope that were never meant to come in contact with any form of moisture. Just about all medical endoscopes are designed to be water-tight so that the functioning parts of the endoscope (fiber bundles, CCD chip, articulating cables, etc.) stay dry while being used during a procedure or soaked in water and/or cleaning solutions. Leak testing is the simplest way to help prevent serious (and expensive) damage to the flexible endoscope. While many manufacturers sell leakage testers, ESS sells the ATT-Series Airtight Leakage Testers with connectors to fit virtually ALL makes and models of endoscopes! It is a simple device that uses air pressure to pressurize your endoscope to see if there is a leak somewhere in the endoscope. They come with a 'bulb' to pump air into the endoscope and a dial to measure the air pressure. Once pumped to the proper pressure (indicated on the dial) the needle on the dial should not show a loss of pressure in the scope. If the needle drops slowly or rapidly for a steady period of time, then you have a leak. If you endoscope comes in contact with some type of fluid (such as a sterilization or cleaning soak) it will be possible for the water or cleaning/sterilization fluid to seep into the internal workings of the endoscope and cause damage. Fiber-optic Bundle Separation: otherwise known as "Red Crack," where the individual strands of the fiber-optic bundle separate and become unglued, giving the appearance of a reddish, spider-web pattern (the "Red Crack") across the view through your endoscope. The repair for this would be to send the instrument back to the manufacturer and have them install a new fiber-optic bundle; which could end up costing you thousands of dollars! Fogging: If fluids get in between the fiber-optic bundle or the CCD chip behind the distal tip's optic lens, you can get a blurred or fogged view through the endoscope, which prevents you from properly viewing your subject through the endoscope. Internal Corrosion: When fluids get inside the endoscope, the internal metal components can become corroded and/or rusted. This can effect the scope's articulation and the flexibility of the insertion tube. Most, if not all, flexible endoscope have a braided wire sleeve under the insertion tube's outer layer which helps to protect the internal components that run through the insertion tube. If it becomes corroded or rusted, it's flexibility will be hindered. The articulation dials move the flexible distal tip with a series of steel wires lubricated with silicone and is sealed inside the insertion tube. If they come in contact with fluids, the silicone lubrication can become contaminated and prevent the proper operation of the wires. There's also the possibility they can corrode and break away from the angulation controls - thus preventing you from properly operating the distal tip while doing a procedure. Electronics Failure: Fluid invasion with a video endoscope can be just as devastating. Instead of the fiber bundles, the CCD Chip that records the image from your distal tip lens can become damaged - think of it as dropping your smart phone into a bucket of water and then trying to use it! Probably won't work so well. The fine copper wires that run from the CCD up to the electronic circuit board in the umbilical video connector can become corroded and prevent the signal from getting through. Also, the internal circuit boards, both in the handle (for camera controls in the handle), and the umbilical connector (for connection to the video processor) can become damaged and cease to function. These can be very disheartening revelations for you and your practice/clinic/hospital. Having to shell out hundreds to thousands of dollars in repair as well as the loss of the use of your endoscope, can cost you time and income; which is extremely frustrating when you realize it could have easily been prevented! Check out our selection of ATT-Series Leakage Testers over at our online store to see which one is the perfect fit for you! If you have any questions about the Leakage Testers or how to leak test your endoscope, contact us and we'll help out! Once you get your Leakage Tester, the best thing to do is to get into the habit of testing your endoscope(s) frequently. They should be tested before and after each procedure to ensure the scope is maintaining its water-tight seal. The ATT-Series Leakage Tester is portable enough that you can keep it on our equipment cart and immediately attach it to the endoscope to test right after your procedure is completed. Sometimes, when threading a biopsy instrument through the biopsy channel, the instrument head can get caught in the tube and make a tear. The biopsy channel is a thing, polyurethane tube that runs down your insertion tube to the distal tip. If you forced your instrument through and think you might have punctured the biopsy channel, a post-procedure leakage test would reveal if that is indeed the case. 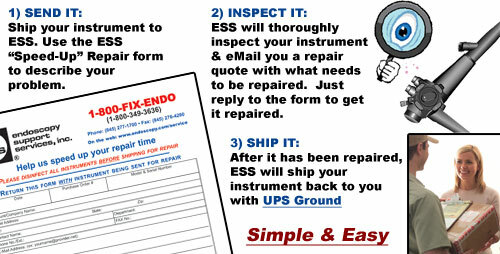 If you did tear your insertion tube, or your endoscope fails the leakage test for any other reason, make sure to send it in to our Service Department as quickly as possible! Our service technicians will evaluate and take the best course of action to get your endoscope back to you in tip-top shape!